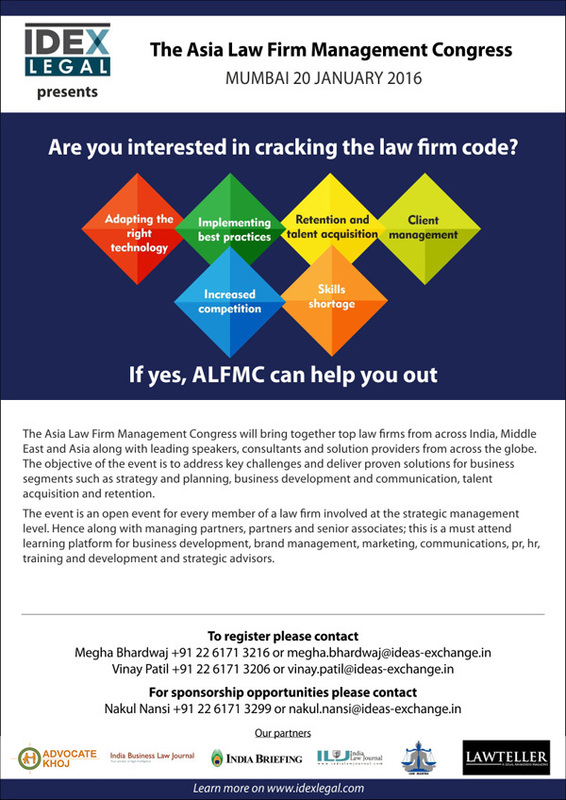 IDEX Legal is pleased to announce the Asia Law Firm Management Congress 2016. IDEX Legal through its extensive research with dozens of partners has identified these three themes that are of current and significant interest for Indian and Asian law firms. In the current dynamic legal industry in India, The Asia Law Firm Management Congress will address the aforementioned topics and multiple sub-topics under each category that are critical in determining the success of a law firm's outreach, internal and external practices and most importantly its profitability in the competitive nature of a legal market. The event is an open event for every member of a law firm involved at the strategic management level. Hence, along with Managing Partners, Partners and Senior Associates; this is a must attend learning platform for Business Development, Brand Management, Marketing, Communications, PR, HR, Training and Development and Strategic Advisors. The event will address best practices not only on governance and development but also functionary departments including human resources, public relations and marketing. Take the first step towards embracing change and building a competitive firm and to thrive in the 21st century.